» Worst home defensive record in more than half a century! ﻿As our first clean sheet in over two months brought hope that the defensive crisis at Elland Road may finally have been resolved, I decided to take a statistical look at the season so far to see how it compares to past seasons – and it makes for extremely bleak reading if you’re Simon Grayson. To date, Leeds United have conceded an average of 1.68 goals per game, which is a remarkable contrast to last season when we were one of only two League One sides to keep below the goal a game average with 0.96. The last time Leeds United finished a season with a worse defensive record than our current one was 2003-04 when we were relegated from the Premier League. 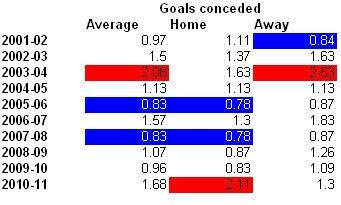 On our travels, an average of 1.3 goals conceded per game is nothing out of the ordinary. 1.3 is only marginally worse than the 2008-09 season and better than 2002-03, 2003-04 and 2006-07. At Elland Road however, Simon Grayson is on course to break a record that has stood since the 1959-60 season. 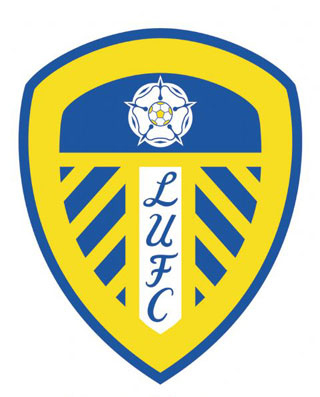 With an average of 2.11 goals conceded per game, you have to go back to the relegation season of 1959-60 to find a team with a worse record at Elland Road – and that record is well within reach, at 2.19. The following chart shows the stats from the past decade, with the worst (red) and best (blue) defensive records highlighted.